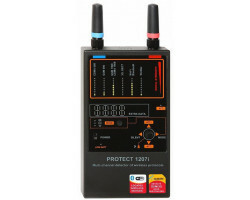 The Protect 1207i is a reliable tool for tracing different digital transmissions such as GSM, Bluetooth and other wireless transmissions (Cellphones and GPS transmissions). The sensitivity of a common RF detector (bug detector) is spread along a wide frequency range, usually 3, or even 6-7 GHz. This means the common detector cannot detect such weak and non-continuous signals as Bluetooth, Wi-Fi or Wi-Max. Even more powerful signals like GSM-1800 are also hard to detect because of their low sensitivity at higher frequency ranges. Each detection type has its own bar graph to show signal strength. There is an attenuator button to use when honing in on a signal. In “display mode” when a signal is detected the signal type will be shown in the “extra data” display. -Setup mode with selection the threshold level for vibration.